Climate action in the Border region. Visitors to our website might have noticed fewer posts this past year or so. This is because many of us have been focused on the Adani Carmichael coal mine. If the mine proceeds it would be Australia’s single biggest contributor to climate change and the equivalent of adding a new country with emissions 1.5 times Australia’s. 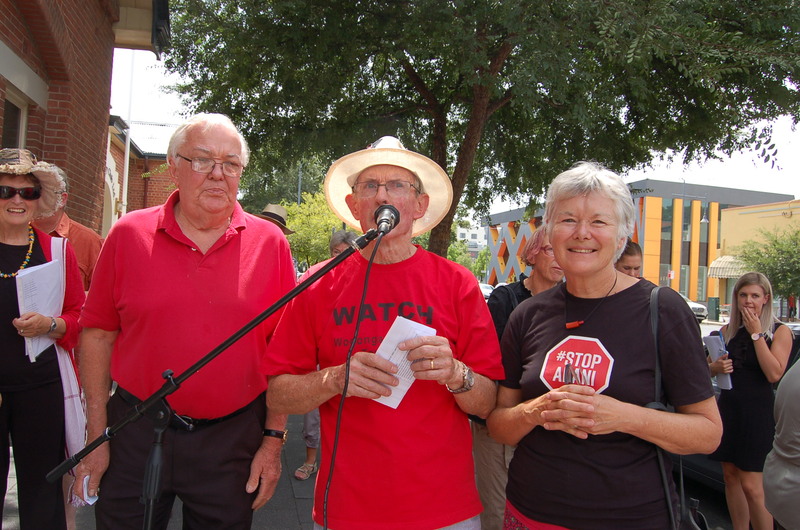 Last week WATCH members were out in force with StopAdani Albury-Wodonga, targeting MP Sussan Ley’s office, featuring a long queue snaking its way to Dean St to deliver 138 personalised letters opposing the destructive mine. WATCH member Bruce Key was MC (pictured in WATCH t-shirt), with former Albury Deputy Mayor, Claire Douglas our brilliant guest speaker (pictured to the right of Bruce). 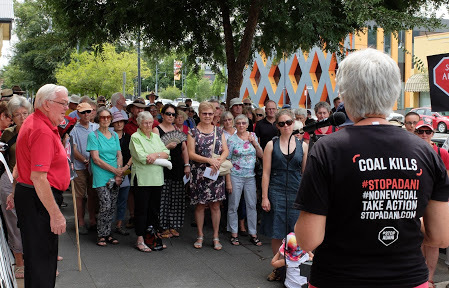 Other StopAdani Albury-Wodonga actions have included meetings with MPs, surveys, stalls, petitions, film nights, rallies and several CBD walks with our large STOPADANI letters. Until this mine proposal is dead and buried, WATCH’s capacity to coordinate additional actions will be limited. But we’ll continue to produce the popular WATCHWORD newsletter, write articles for Living Lightly, field media enquiries and chew the fat at our bimonthly meetings. Please get in touch and/or come along to one of our meetings, but most importantly we want you to talk, talk, talk about Adani … to family, friends, neighbours, colleagues and politicians. Write letters to the editor, phone radio talk-back and make it abundantly clear the mine must not proceed! March 1, 2018 in #stopadani, Community Action, Events, Politicians.